A few nights ago, I had planned on making baked chicken with veggies. How bland is that? 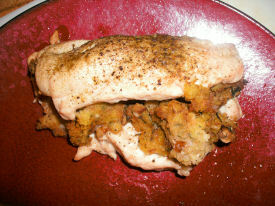 As I turned on the oven, an idea popped into my head: stuffing! I tend to buy things to keep in the pantry to use at a later date and boxed stuffing just so happens to be one of those things. I looked in my pantry and low and behold, I found a box of stuffing! 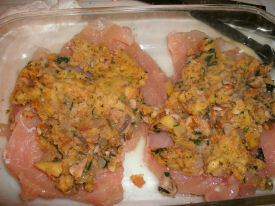 I then started to look in my refrigerator to see what I could add to the stuffing. I found cilantro, mushrooms and onions. I then went back to my pantry and found some walnuts. I also had some apples sitting in my fruit bowl on the cabinet. Horray! 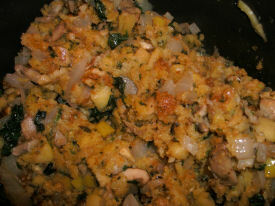 I had all of my ingredients to complete my stuffing. First, you will need to find a pan to cook the chicken in. I typically use a glass pan. Lightly coat the pan in olive oil. Turn your oven on bake at 400 degrees F. Let the oven preheat for 10-15 minutes. Take your onion, mushrooms, apple and cilantro. Dice/cube all of those items into to very small pieces. 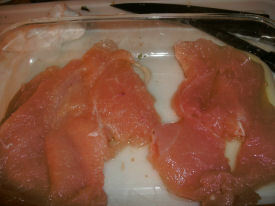 Take another pan out and turn the stovetop on high heat (I have a gas stove and can control the heat very easily). Add a bit of olive oil in your pan. 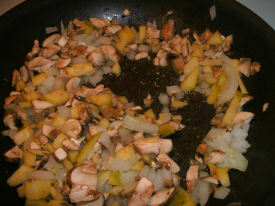 Once the oil is heated, add your onions, mushrooms and apples first. 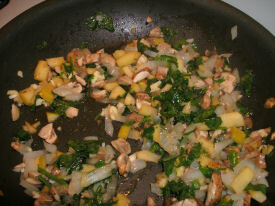 Cook those items until the onions begin to caramelize (turn golden brown). Next, you will add in your cilantro (and garlic if you choose). Add your walnuts. My walnuts were larger and I had to crush them up a bit. This is one of my own creations! Enjoy!